Apropos of nothing, here’s a post about a series of reactions that is a common source of student difficulties. It’s called the malonic ester synthesis, and it’s an interesting way of making substituted carboxylic acids. There’s an essentially identical process called the acetoacetic ester synthesis and it makes substituted ketones; the only difference between the two processes is the choice of starting material. Here’s an example of both processes. Pay attention to the bonds that form and the bonds that break. 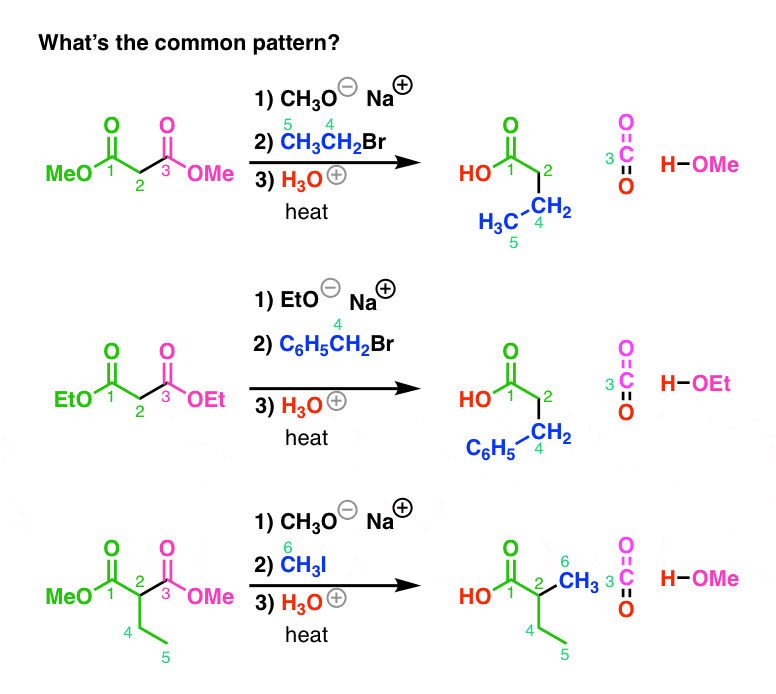 Before going into the mechanism, see if you can identify the common pattern for each of these malonic ester syntheses. Follow the different colors of atoms. Where does each come from? Where do each of them go? The cool thing about this process is how it’s built from a series of simple reactions. Again, mechanisms in organic chemistry are a lot like music – from a small number of parts, we can build up something complex. 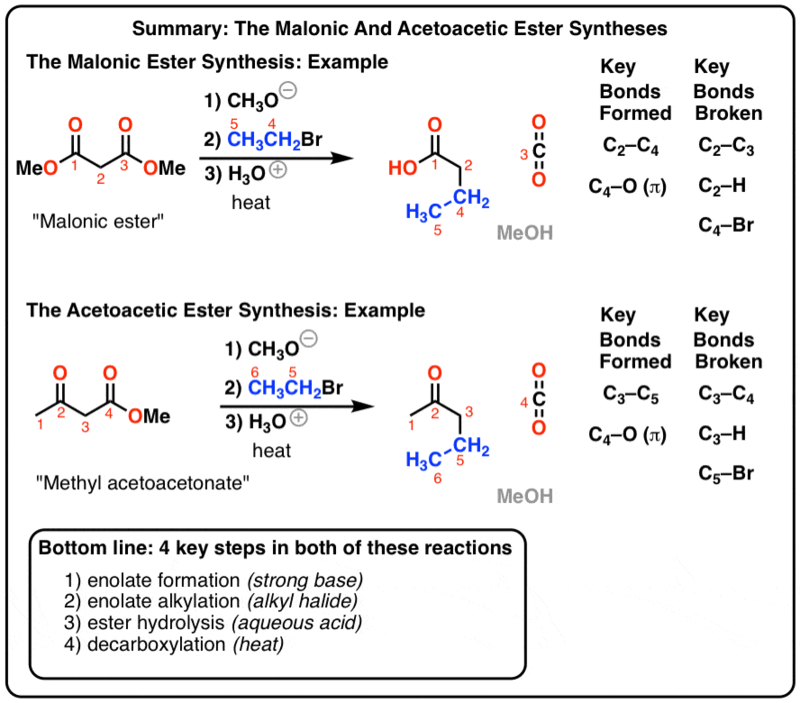 Let’s walk through the mechanism (focusing on the malonic ester synthesis for brevity – the acetoacetic ester synthesis mechanism is identical except we’re starting with a different compound). In the first step, a base (CH3O– in this case) removes the most acidic proton from the ester (on C2 here, with a pKa of about 13) to give anenolate. The resulting enolate can be drawn as one of two resonance forms. Now comes the part which often gives students trouble. When carboxylic acids have a carbonyl group (C=O) two bonds away, they can readily lose carbon dioxide. Why? Because the carbonyl can act as an electron “sink” for the pair of electrons coming from the breaking C–C bond, forming an enol. This is called “decarboxylation”. Note how this is also the case for carboxylic acids with a ketone two bonds away, so-called “β-keto acids”. Finally, the enol that is formed is not a stable species. It can undergo transformation into its constitutional isomer: in this case, a carboxylic acid. These two constitutional isomers are in equilibrium with each other, although the “keto” form (with the carbonyl group) is greatly favored. This process is called “tautomerism“. Again, the key point to make about the malonic ester synthesis is to observe the pattern of bonds formed and bonds broken. As with any reaction in organic chemistry, if you can see the pattern going forward, you should be able to apply it going backward as well. See if you can figure out how to make compound A from a malonic ester synthesis. Secondly, it’s also possible to do two alkylations before doing the aqueous hydrolysis step. Can you figure out how to make B from a malonic ester synthesis? Hi I would Like the solution please. Hi is there a mechanism for the end step, where the malonic ester is converted to a carboxylic acid in the presence of acid? Can you please talk about the stereochemistry of the disubstituted malonic ester synthesis? Is the product racemic? Thanks! Thanks for the comment. Yes, the product of the malonic ester will be a mixture of stereoisomers – it goes through a flat (planar) enol (after decarboxylation) and then protonation of the enol can occur from either face. If that’s the only stereoisomer present, then yes, the product will be racemic. If there’s already a chiral center in there somewhere, then you’ll get a mixture of stereoisomers. Pretty sweet article, and thanks for the answer upload james. I worked them out right, but it’s nice to have something to check against to boost the confidence. Thank you for you work the website is very helpful and I am here constantly! Thanks for the time and effort you put into it, definitely HUGE HELP! Could you please explain why the base(hydroxide here) prefers to deprotonate the alpha carbon instead of attacking the carbonyl carbon Is this a general rule? Would deprotonation, even a second time be preferred to a 1,2 addition?? Why is this reaction called a Malonic ester “synthesis”? We’re starting with a malonic ester and ending up with a carboxylic acid, we aren’t creating a malonic ester in the end. My teacher has us use saponification instead of acidic hydroloysis of the ester (I believe because it is more efficient). If I use saponification, do I need to add a separate acid workup since it makes a carbolylate or can the decarboxylation occur directly after this step?